34,300,000 <– No of google search results for chicken burrito bowl. Everyone loves a burrito bowl. Spicy, healthy, balanced, comforting and so many flavors. And most importantly, anything eaten out of a bowl screams comfort, right! 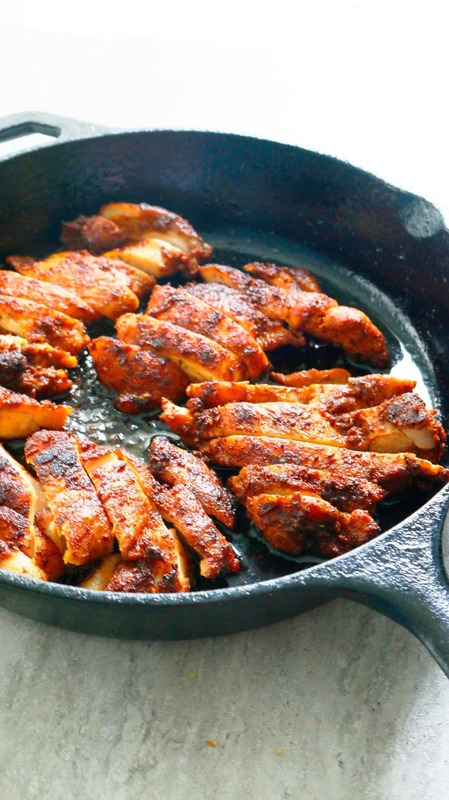 It all begins with this easy Mexican Spiced Chicken. 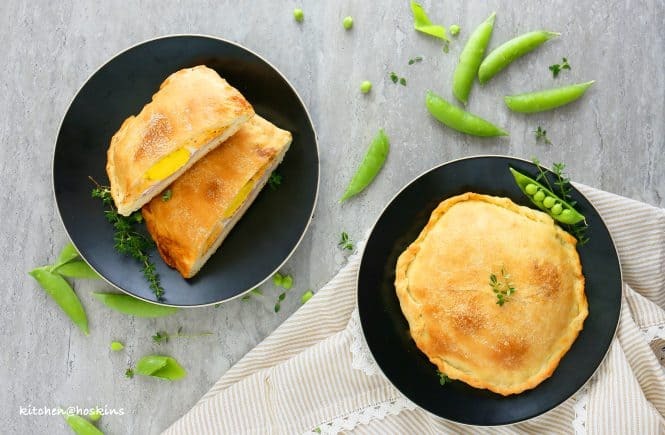 I make 2 or 3 batches, use for dinner and store leftovers in the fridge or freezer. Great in these Spicy Chicken Ranch Quesadillas, tacos, salads and of course these burrito bowls. Why is a burrito bowl so popular ?? It is totally customizable to your liking! One or two main components and add whatever your heart desires. 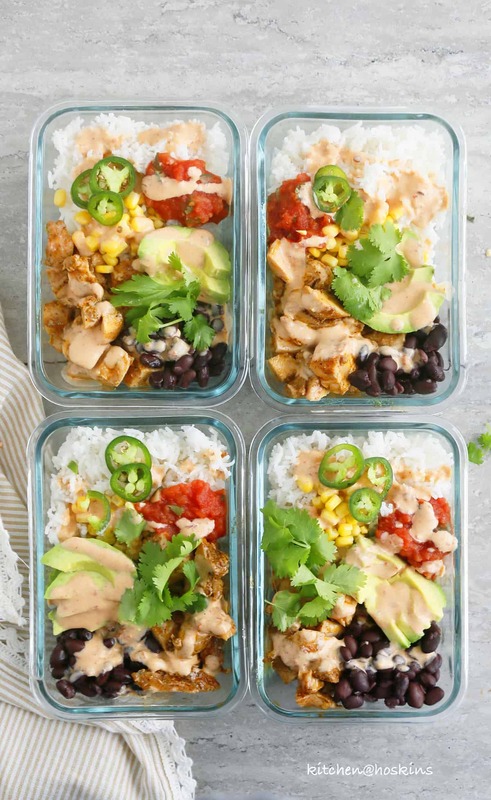 How to make this spicy chipotle chicken burrito bowl? 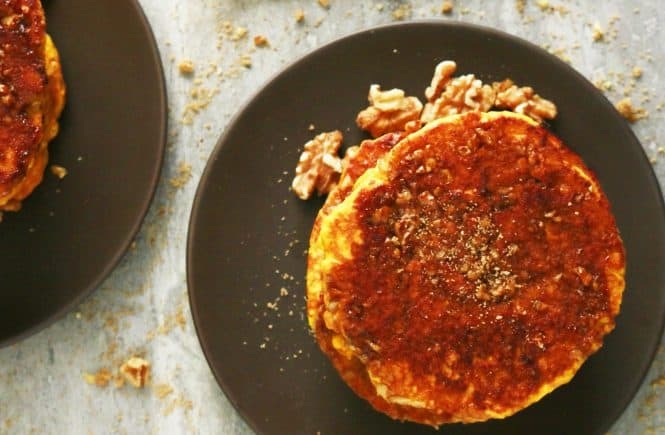 Heat your cast iron skillet. Toss chicken with spices and cook. Chop into chunks. Cook rice or use leftover rice or shredded lettuce if you are watching your carbs. Make salsa or pico de gallo or pick up your favorite brand from the store. Slice some avocados <— ain’t a burrito bowl without it. Sliced jalapenos. Spicier the better (at least for me). Chipotle sauce <— sour cream works well if you are pressed for time. 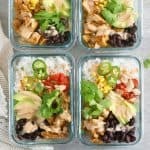 How to prep spicy chipotle burrito bowl for meal prep? Divide cooked rice, chicken, black beans, corn, jalapeno into meal prep containers and store in refrigerator. Make chipotle sauce and divide into small jello shot containers in refrigerator. Have ripe avocados, jarred salsa ready. When you are ready to eat, heat rice-chicken (make sure the containers are microwave safe). Top with avocado, salsa and cilantro. 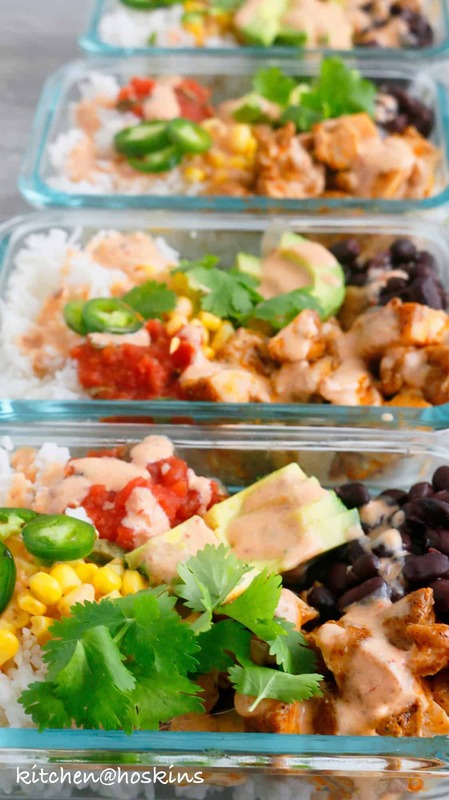 Can’t have enough burrito bowls? 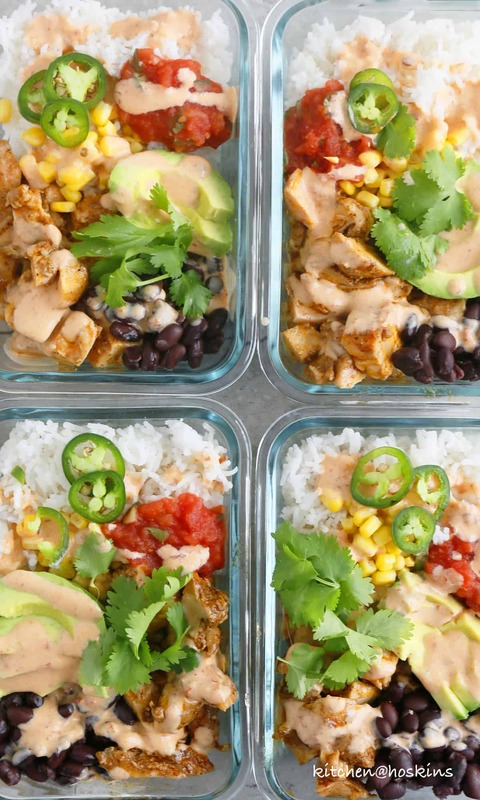 Try this Chicken Burrito Bowl made with ground chicken or this Chickpea Taco Meal Prep Bowls made with canned garbanzo beans. Add all ingredients into a mini food processor or small blender and blend until smooth. Store in the refrigerator until use. 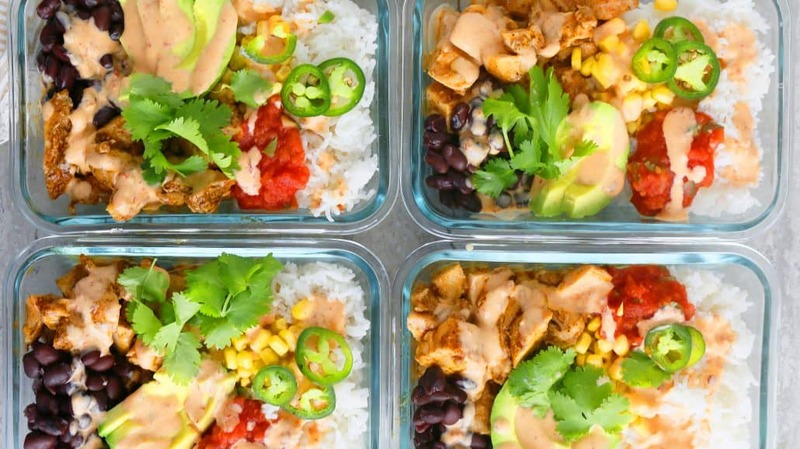 Divide chicken, rice, black beans, corn, salsa, jalapeño pepper, avocados and cilantro into serving bowls. Drizzle sauce and enjoy. 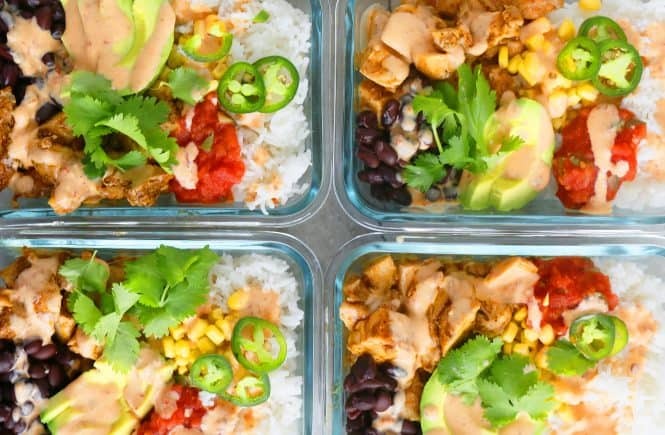 Divide chicken, rice, black beans, corn, jalapeño pepper and cilantro into meal prep containers. Pack chipotle sauce into small jello shot containers. Top with salsa and sliced avocados just before eating. 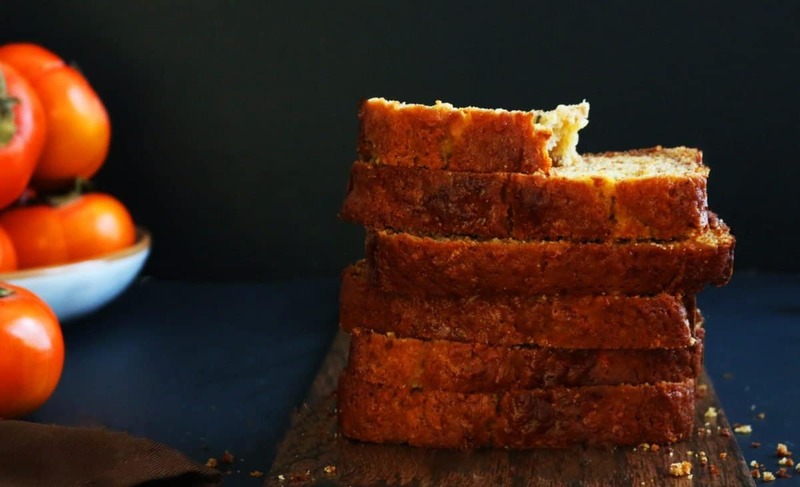 Skip rice for carb-free version. Chopped lettuce may be used instead of rice.